Annie's at Canal Yard is set in the picturesque, sleepy, canal side hamlet of Thrupp in Oxfordshire and was originally part of the old British Waterways Yard. The hamlet of Thrupp is off the A4260. Simply turn at the signpost to Thrupp, follow the road all the way round and come over the lift bridge. Car parking is behind the tea room. 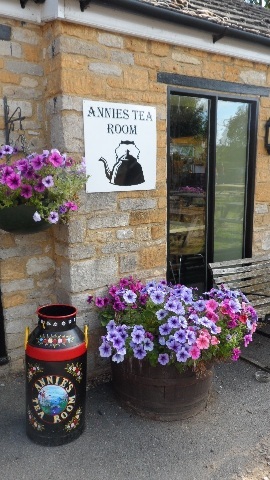 Annie's Tea Room is owned by Douglas and Henrietta Reeve who live in the local area and have owned the business for over nine years. Please feel free to contact us with your comments and suggestions, as we'd be very happy to hear from you. At Annie's Tea Room, we try and source the freshest and best quality ingredients, as locally as possible, to produce our enticing range of delicious food and cakes. We're proud to support local businesses and our community. Bartlett's are a traditional butchers with traditional values based in the High Street in Kidlington. They source only the finest meat produced, including English beef, pork and lamb, complimented by a wide range of poultry, game, cooked meats and home-made products. Established in 1966, La Patisserie has been delighting customers in Kidlington for more than 46 years and bake their own bread in-house at the bakery, using only the finest natural ingredients for the best possible taste and freshness. They use high quality flour supplied by Clarks of Wantage who are probably the smallest flour mill left commercially roller-milling wheat. Beechwood Farm is a family business supplying free range eggs to the local community. Based in Hampstead Norreys Berkshire, the farm has been in the family for over 50 years. Their aim is to provide local shops, restaurants and the community with the freshest tasting eggs. All of their hens are free range and they believe in giving them a quality life on the farm, which means a quality egg for you. Produce Warriors are a family run-firm based at a secret location in Banbury. They are passionate produce warriors who are here for one thing - to serve their valued customers with the right produce at the right prices to do the right job for them.